Protein labeling reagents are used for various assays that are coupled with antigen-antibody reactions. Of these, fluorescent, biotin, and enzyme labeling reagents are used most frequently for antibody labeling. Most protein labeling reagents have similar reactive sites, such as succinimidyl ester (NHS) for amino groups and maleimide or bromoacetamide for sulfhydryl groups. Dojindo offers a wide variety of protein labeling kits. These kits can be used to prepare conjugates with enzymes, fluorophore, and biotin. 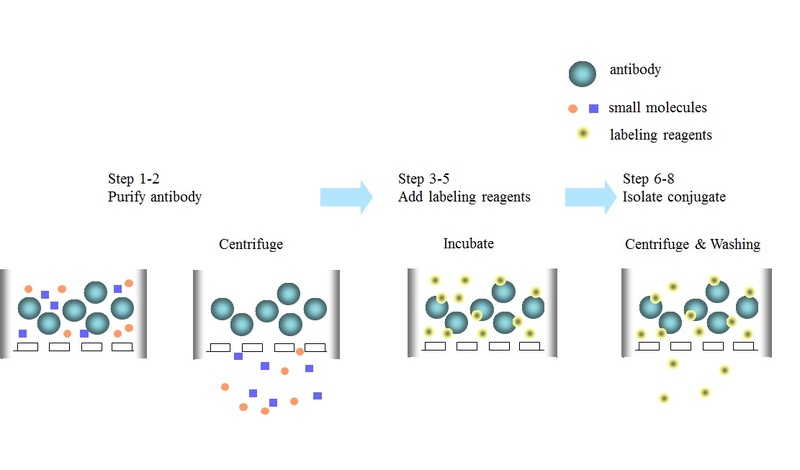 Dojindo’s labeling kits contain centrifugal filtration tubes, which are used for protein purification, conjugation reaction, condensation, and buffer exchange. Our newest addition, Ab-10 Rapid Labeling Kits allows simple and rapid preparation of enzyme or fluorophore conjugates with a smaller quantity of antibody. *Ab-10:Some additives in the antibody solution may interfere with the labeling if the concentration is too high. The maximum compatible concentrations of such additives are indicated in on Table 2.